The Nelson Family's circus history dates back to the middle of the 19th century. Robert Nelson Sr. was born in England in 1840. At an early age he began performing acrobatics in the streets of London and soon formed a troupe of performers. While working with a circus in England Robert met and later married Emma Smart. Although the Nelson Family performed many circus acts, they are best known for their "Risley" routines. Risley or "Foot Juggling" is an act where one performer lies on his back, supporting another performer with their feet and tossing them about. The Nelson Family first came to the Americas in 1866 just after the American Civil War. 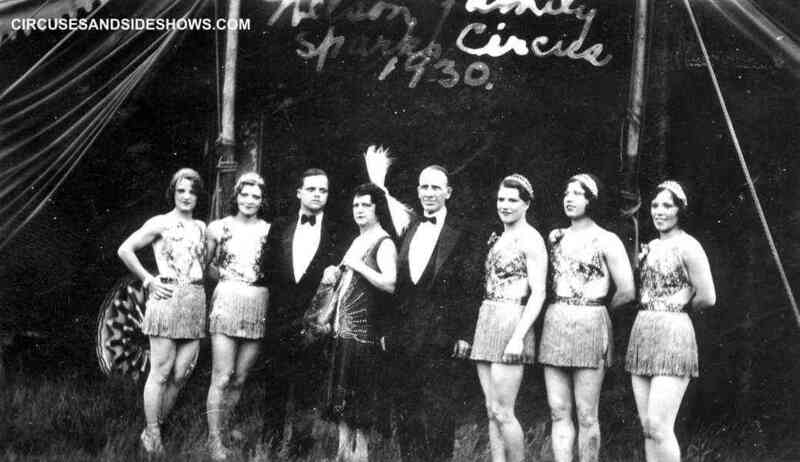 The family act worked with various circuses in the United States then performed in Cuba. While in Cuba one of the members of the troupe died from Yellow Fever causing the team to break-up. Several members of the cast went to South America and opened a circus. Robert formed a new act with his two sons Arthur and Robert, Jr.. In 1871, after performing in New York City the Robert and his troupe were hired to perform on the Dan Rice Circus, where they would remain for the next four years. From 1875 until 1880 the Nelsons performed in Europe, then returned to the U.S. and played theatres for two years then back to Europe. The troupe returned to the Americas in 1885 where they worked with the Primrose and West Minstrel Show they then toured Mexico with the Orrin Bros. Circus. In 1887 The Nelson Family opened their own circus titled "The Nelson's Great World Combination Show. The family performed most of the acts, Robert Jr. served as manager and his father as ringmaster. The circus operated until 1894. After the close of the Nelson's circus the family performed on the Ringling Bros. Circus in 1895 and 1896 . At that time the troupe consisted of nine members Robert Nelson Sr., Robert Jr., Artie Nelson (son of Robert Jr)., Arthur Nelson, Alice Welch, Liza Welch, Bill Welch, Sid Buttons and Adel Nelson. In 1897 The Nelsons worked on the Great Wallace Shows where they remained for five years. 1902 until 1903 The Nelsons again were with: Ringling Bros, then the Walter L. Main Circus, 1904; Hagenbeck-Wallace, 1907; and Sells-Floto, seasons of 1909 and 1910. In 1911 Robert Nelson Sr, and his wife Sarah retired to their home in Mt. Clemens, Michigan, leaving his son Arthur to lead the act. For the 1911 season the family were with the Hagenbeck Wallace Circus. In 1912 the Nelsons went to Australia and performed with the Wirth Circus. While performing with the Wirth Circus, Robert Jr. became and died. On Dec. 25, 1916 Robert Nelson Sr. Died at his home in Mt. Clemens, Mi, the family was at that time performing with the John Robinson Circus. .In 1923 the family were featured on the Ringling Bros. and Barnum & Bailey Circus where they remained until 1926. 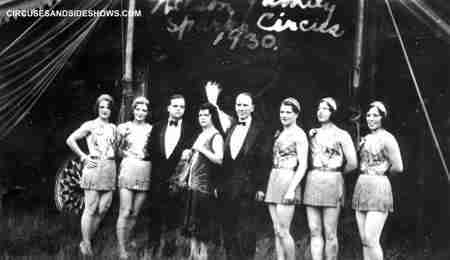 In 1935 the Nelsons performed with the newly formed Cole Bros Circus. That same year Estrella Nelson daughter of Arthur, married the circus' co-owner Zack Terrell. On December 30th 1992, The Nelson Family were inducted into the Sarasota's Circus Ring of Fame. On January 6, 1969 the Nelson Family was inducted into the Circus Hall of Fame.